Subject: Re: Recovery, for real? Increases driven by growth in developing regions and economic upturns. Global demand for cabinets is projected to reach $64 billion in 2018 on advances of 5.5 percent per year. Increases will be driven primarily by robust growth in developing regions, as cabinets increase their market penetration in residential markets at the expense of other storage options such as freestanding furniture and shelves. An additional boost to global expenditures on cabinets will come from a recovery in demand in developed countries, where building construction was depressed as many countries faced economic downturns. These and other trends are presented in World Cabinets, a new study from Freedonia Group, Inc., a Cleveland-based industry market research firm. The U.S., the world’s largest market for cabinets, will see strong increases in demand through the forecast period. Following the collapse in U.S. housing construction that began in 2006, cabinet demand declined for several years. According to analyst Mariel Behnke, “A recovery in building construction spending, particularly in the residential market, will boost US cabinet demand to $16 billion in 2018.” In addition to stronger construction activity, interest in more expansive kitchen and bathroom designs will boost unit demand for cabinets, while rising interest in premium features and finishes will support value growth. Cabinet sales in the Asia/Pacific region, the largest regional consumer, are expected to reach $20 billion in 2018, nearly one-third of the global total. The Asia/Pacific region will also see the fastest regional growth, at 7.3 percent per annum through 2018, fueled by rapid demand growth in developing countries, primarily China and India. China is expected to continue to see the fastest increases in cabinet demand of any country, surpassing Japan to become the second largest global cabinet market. Rapid growth in installations of cabinets in new and existing homes, as well as in nonresidential buildings, will support the robust demand growth in China. Western Europe, the largest regional market for cabinets in 2013, is expected to recover from the declines suffered during the economic recession, with cabinet sales reaching $17.5 billion in 2018. However, by that year it will be surpassed by both the Asia/Pacific region and North America, which can expect more rapid growth. Western Europe’s intensive cabinet use and continued interest in high-end features will support the recovery in demand in spite of expected stagnating housing completions in some countries. Do they really know? Pretty easy to see the current up swing. There should be pent up demand, increases seem likely. No crystal ball needed or for that matter consultants. I agree with Larry. The consultants get their numbers from the government. So, if you believe this report, you must be a communist. Specious baby, specious. 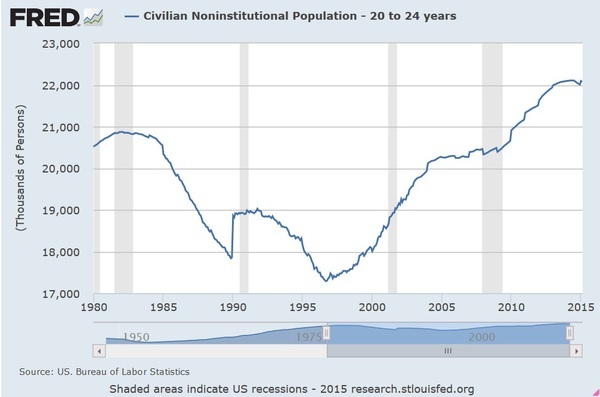 I think the primary drivers they look at are demographics and the business cycle. The question that occurs to me is that the current growth is not organic or pent up demand. The jobs are not being created and jobs are what makes people want to buy houses. IOW the current upswing is because of boomers and investors. The cost of housing is too high for most families, it is not because of an unwillingness to lend. These Graphs show what I'm talking about. That was from a private company. Big picture wise the big growth is going to be Nigeria. It will not be here or Europe as the demographics and the debt are going to fetter the economy. 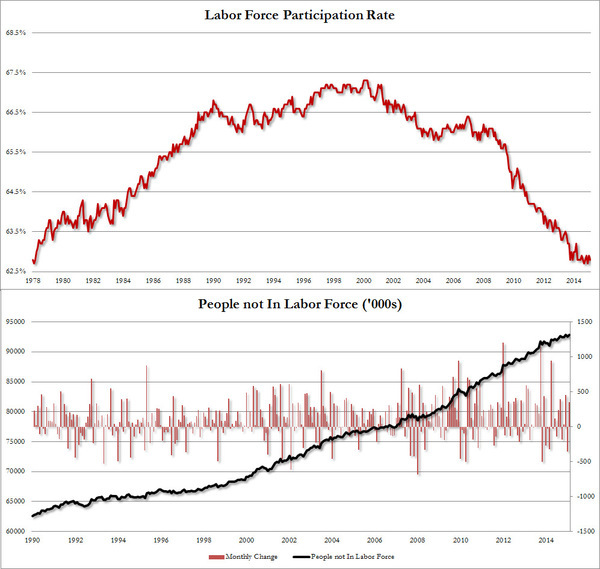 One can surmise from the two graphs that we have a lot more people and a lot more people NOT working. Most business owners don't need a graph to figure that one out. No, except for the rich. It was very, very real for them and it is about to come crashing back down. Hope you made your hay while the sun was shining because it is about to rain very hard. What unit of time is about? This year, next year, next decade? It looks like the growth and demand is coming around 2018. Maybe it is a sign from the heavens that the 2016 election will be the one that fixes the mess. The article that started this thread is an example of how hard it is to talk the economy up as opposed to how easy it was to talk it down 7 years ago. 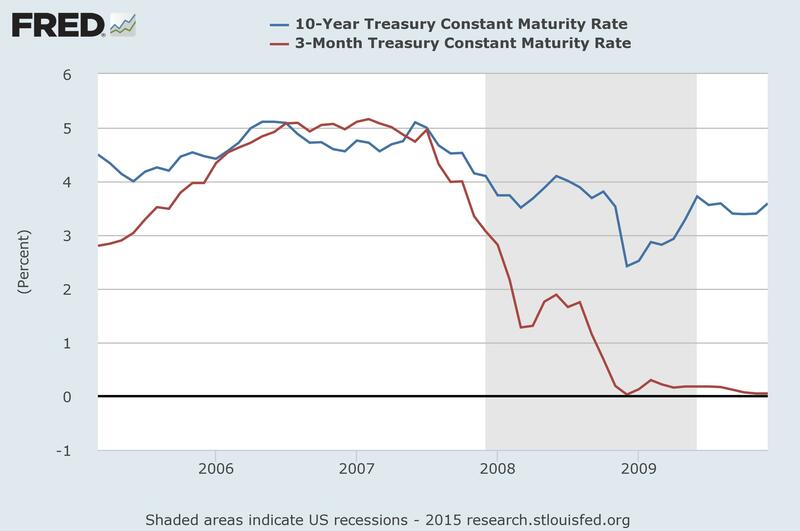 3 month bonds are paying more than the 10 year bonds most of the time there will be a recession. See the graph below at about 2007 the 3 month treasury payed more than a 10yr treasury. And there was a slight ripple in the economy that year. But demographics are definitely a big driver. Anyway you say"It looks like the growth and demand is coming around 2018." Where are you getting that from? Who knows? 1-24 months is my best guess. And it is just that- a guess. Even the smartest financial guys will tell you timing is impossible. But it will make 2008 look small. Think Great Depression but with people lacking the work ethic, morals and experience of living through hard times that the people of the 1930's had and a government that is broke and spent all it's ammunition to further build a bubble that will bring the world to it's knees when it pops. World War III is on it's way. Don't trust the bank with your money. Don't buy the stock market at all time highs. Don't go into debt planning for growth. Worry about surviving the next decade because life as we know it in the house of cards that debt has built is about to crash. Your best investments are food, acreage,bullets and precious metals. Laugh all you want. Remember you were warned. And I'm accused of being negative. Yea some bad stuff is going to happen in 2030 because of entitlements and it will be bad. OTOH a friend mine indicated that we have an 18 trillion dollar economy, (less if you take out government spending) here, that is a juggernaut that is really hard to slow down. I was giving the sanitized cheerful version too. Your welcome to your 2030 opinion, but that is optimistic by a long shot. Nobody saw the fall of the Soviet Union, the dot.com crash or 2008 either- everybody thought those were years or decades away. When the jig is up the jig is up- things happen really fast when you have trillions of dollars of debt, hundred trillion of dollars in liabilities, and hundreds of trillions in deriviatives- stuff that makes 18 trillion look very, very small. When 47% of the population is on government handouts, the middle class has lost 40% of it's wealth, and 92 million working age people are without work- the only reason we haven't faced a depression already is our reserve currency status. But that is changing very quick- and if Russia and China have anything to say about it and believe me they do-it will be measured in months and not years of the US dollar being the reserve currency. The books are so cooked in all western countries that it will happen fast as soon as the tide turns it will happen incredibly fast. I wish I had your optimism but I'd rather deal with reality. By planning ahead I can deal with reality- and enjoy life ahead of it and then through it. Hope for the best, prepare for the worst. Pat, your friend was probably talking about our 18 trillion Debt, not economy. Ok but you have to look at cause and effect. 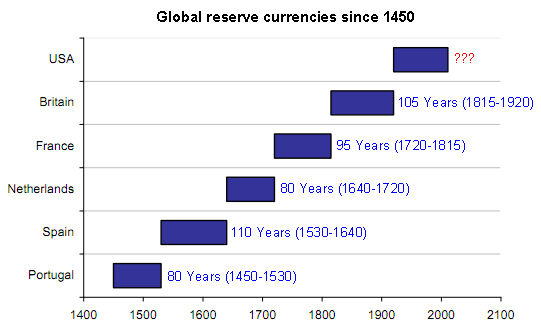 What you say about a reserve currency is true and we are long in the tooth for that to change and it will change quick as there are not going to be two reserve currencies it will quickly become one or the other. OTOH the reason the dollar is strong right now is trust, which is not likely to be extended to communist countries? 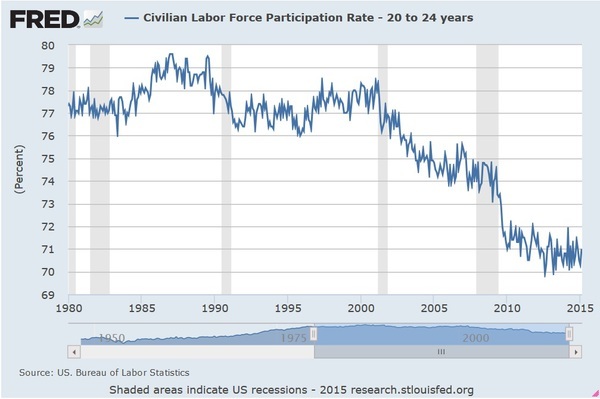 The terrible BLS numbers are not a cause because they are already here. IOW we have already adjusted. And I think they will get better because of on-shoring. But we are paying what 250 - 300 billion a year in debt service at almost 0 interest. The historical avg is what 6%, that 250 billion turns into over a trillion right quick. Add to that the entitlements whereby the out go is greater than the tax revenue. The avg retiree will receive 7 times what he paid into medicare. That does not work. And maybe a loss of reserve currency status and there will be default. It is just a math problem politics are irrelevant. Technology changes everything. The reserve currency in a world where you can log in at any time and get an exchange rate 24/7/365 with any first world currency and most third world currencies is a thing of the past. Trust-are we trustworthy? No we are the least dirty turd in the cess pool of currencies-all of which are made up out of thin air & are only worth the trust put into them. They are backed by nothing but the faith people have in them. Trust changes in 24 hours in this world. Your timelines work in a world where trades take a human buying or selling, or even pushing a button- but we live in a world where trades take place by the millions in micro seconds. Things that used to take decades happen in weeks. Things that took a year take place overnight. You are thinking that a default has to take place- even though I think that is very likely- all that has to happen is enough people to think a default will take place and you have a default taking place. Google what the rich are doing with their money- they are buying gold and buying remote compounds for when the world falls apart. The confidence is teetering on the brink and one morning you will wake up and the gentle nudge the world needed to come crashing down the cliff will have already taken place. 99.9% won't see it coming till it's already happened and by then it will be far, far to late. You guys have reinforced my usual up-side-down point of view. Time to invest. About a year ago I pulled some $ out of the markets so I would be holding cash. Plan was it would be a cushion if business fell or could be used, with some current income if the sky didn't fall, to invest in new equipment. Sky didn't fall. Made some $. The delay has made our equipment a year older than before and it was a couple of years past replacement then. To stay even with advances in productivity and aging, a small company like mine needs to invest about $100K per year in the business. Since most of the new equipment exceeds $100K each, something isn't purchased every year. Do you really want to be running a 10 year old router when the productivity of a new one can be 20% greater with the same man hours? Place your bets and spin the wheel. I'm not doing the chicken little thing, but it will happen it is just math. Do you make a better return investing in the stock market or investing in your woodworking business?